This Thursday night, CMT will air MUSIC BUILDS: THE CMT DISASTER RELIEF CONCERT live from Nashville at 9 p.m. ET/8 p.m. CT. The 90-minute concert special features Hank Williams, Jr. and Alabama, Alan Jackson, Keith Urban, Lady Antebellum, Little Big Town, Ronnie Dunn, Sara Evans, Tim McGraw, Trace Adkins and many others to raise awareness and funds for those affected by the recent devastating storms, flooding and tornadoes in the Southeast. The evening’s co-hosts include Erin Andrews, Ron White and Robin Meade, with additional artists to be announced. 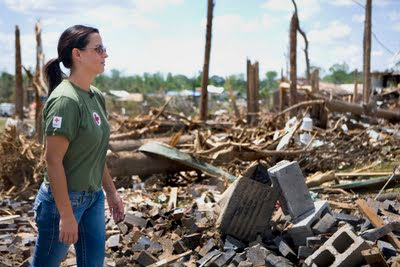 All money raised will benefit the American Red Cross Disaster Relief efforts. MUSIC BUILDS: THE CMT DISASTER RELIEF CONCERT will highlight a number of regions affected by recent storm, tornado and flooding damage including Tuscaloosa and Birmingham, Ala.; Natchez and Vicksburg, Miss. ; Vidalia, La. ; Dyersburg and Tiptonville, Tenn.; and Raleigh, N.C. to name a few. I spoke with relief-concert organizer (and living legend) Hank Williams Jr. about the concert, and was startled and heartbroken by the personal and material destruction caused by the series of tornadoes and floods all across the Southeast (just a few hundred miles away from my Orlando home). Celebrity Extra: You got this relief concert together pretty quickly. Can you take me through the process of when you realized something needed to be done up until the actual organization of this all-star concert? Hank Williams Jr.: All across the South we had those three days of killer weather that happened about 10 days ago. To put it into perspective, we are living like swamp people right now. I’m taking my son to school in a flat-bottom boat to get to the car from my house. When we go back this evening, we’ll drive, we’ll get out, we’ll get in the boat, hook up the little electric motor and drive through the water to go through the gate to get to our house. That’s up here by Kentucky Lake, Tennessee River. The Nashville flood was completely overlooked by the media like, “So what?” And I thought, “Okay, I’ll call some heavy-hitter friends of mine and we’ll play a benefit at Titan Stadium.” Maybe, just maybe we’ll raise $100,000, and I realized, that’s a drop in the bucket for what they need. So, then I start really getting the numbers straight from the governor’s office — it’s the biggest natural disaster in the history of the state of Alabama. We are talking $2 billion, the biggest insurance claim ever. So, I said, “Well, just one stadium show, that’s just not gonna get it.” Then I thought about a telethon, like what they did for Haiti. That’s what we gotta do. I want the most bang for the buck. Country superstar Sara Evans made a recent trip to Concord, Ala., last Friday to witness first-hand the devastation that has hit the area. CE: You wrangled up quite an impressive list of superstars and celebrities to help with the telethon! HW: When you tell them what it’s about and use your name, they say, “Okay, I’m in.” And the best part is, there are more people signing up every day. I mean, I’m talking to NFL players, SEC coaches. I think it’s going to get really good in a couple of days. You mean, they’re going to answer the phones? WOW. Yeah. CE: For those who are just completely out of the loop, will you also be showing some footage of the disaster, maybe some stuff you get when you go to visit the affected places yourself [today]? HW: I certainly hope so. I mean, that’s what it’s about: the victims, the people who are affected. I asked them to make a backdrop to either put a picture or a name of every single person lost. That’s how I want it to hit home. There was a guy down there I know — I know the whole North Alabama, Birmingham, Muscle Shoals, been in Tuscaloosa forever, off and on — and he really put it in a nutshell. He said, “It’s not about the homes and the vehicles, we’re looking for our children and wives and fathers and mothers this morning.” He really summed it up. And our American media made the very, very dumb choice of showing the Royal Wedding [instead of footage of the disaster]. And the death count is still rising. I don’t know where we’re at now. It’s one small little thing for me to raise money for the Red Cross. CE: With economic times being what they are, I know you are hoping that people will put that aside and just call the number, go to the website, and help our fellow Americans in their time of need. HW: Yes, definitely. We’re going to be there for a very good cause. Times are tough, of course. I want to bring in a lot of people [and money]. The New York Yankees have donated a half-million dollars. I’m pulling all the stops out. When I get motivated I’m kind of like the bull going through the fence. I’m motivated and ain’t nothing stopping it. CE: And you are doing all of this through the Red Cross, as you said previously, correct? HW: Yes, and the reason for that is nobody wants to think, “Where did the money go?” There have been some things exposed in the past couple of years on some of this disaster-relief stuff that will make you sick. Like out of every dollar, they gave only 5 cents to the relief effort. That’s not going to be the case with this, or I wouldn’t be any part of it. That’s why we’re doing it through the Red Cross. If you want to help with the relief effort, go to the CMT relief website or text “REDCROSS” to 90999 to make a $10 donation to support the American Red Cross Disaster Relief efforts.